This jetter propels a highly flexible hose through 1 1/4" to 4" (32 to 100mm) lines–blasting through sludge, soap and grease blockages. As you pull the hose back, it power scrubs the line, flushing debris away and restoring drain lines to their free-flowing capacity. Powerful: Actual working pressure of 1750 psi and flow of 1.4 GPM (5.3 l/min) for fast, effective cleaning of lines. Pulse Action: Two levels of pulse are standard. Activate the KJ-1750’s pulse action to easily negotiate difficult bends and traps. 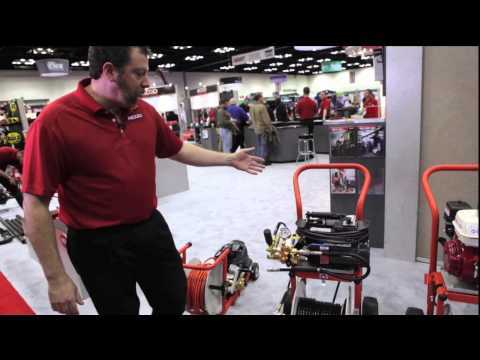 Portable: The optional H-30 Cart rolls the jetter and hose to the job site. 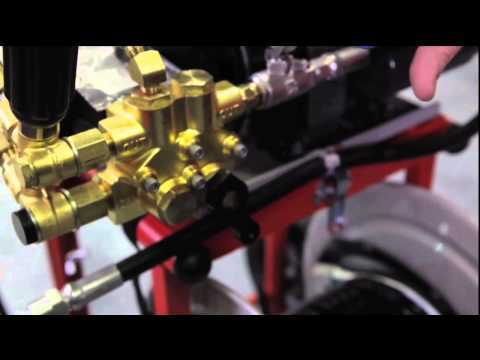 The jetter is easily removed from the cart in seconds for hard to reach drain or for remote storage. Optional adapter allows the KJ-1750 to be mounted on the compact H-10 Cart. Electrical Requirement: The 2.0 HP motor draws a maximum of 17 Amps which requires a 20 Amp, 115V circuit. KJ-1750 Water Jetter is rated 4.5 out of 5 by 4. Rated 5 out of 5 by Hipster from Great features Ridgid makes quality products. We haven't had a chance to use the water jetter yet, but our contractor had the same model and it works great. That's the reason we purchased this model. Can't wait to use it. Better than snaking the waste line. Rated 4 out of 5 by Postalplumber from Easily handled by one person. I had to use this machine to clear a 4 inch sewer main in the office area of the building that I work in. The jet punched through a paper/ other stuff clog that was about 120 feet and 2 clean outs from the original bathroom entry point. The unit was easy to maneuver through the halls and closets/pipe chase to get to the clean outs. Rated 5 out of 5 by rahargraves from Everything about it is great This machine is easy to handle and very effective. I had a 3" drain full of grease and I was done in a matter of minutes. Rated 4 out of 5 by keithsamson from this product is great for cleaning greased up lines. Recently bought this jetter and have not been let down by it as yet. It is extremely easy to use by a single man, saving our customers time and money. The frame is rugged and sturdy, and has great features like a locking pin for the hose real and built in nozzle holders, and the vibration feature works wonders on those hard to get pass areas. Can this unit be supplied wth a 220v motor? We only offer this machine with 115V, 20 Amp motor in the United States. If you are located somewhere other than the US please visit our website www.ridgid.com and in the upper right hand corner select your country to see what is offered. Thank you, RIDGID.